Electra is a beautiful one owner Krogen Express 52 with a Stars & Stripes Blue Hull. She has been customized by her owner who has a keen eye for sensibility and perfection. Electra has enjoyed many of her summers inside and has been lightly used and heavily enjoyed. Her 1,000 hour service has been performed, her life raft has just been inspected and repacked. She's ready for her next adventure...are you? ELECTRA is located at the River Forest Yachting Center in Moore Haven, FL. 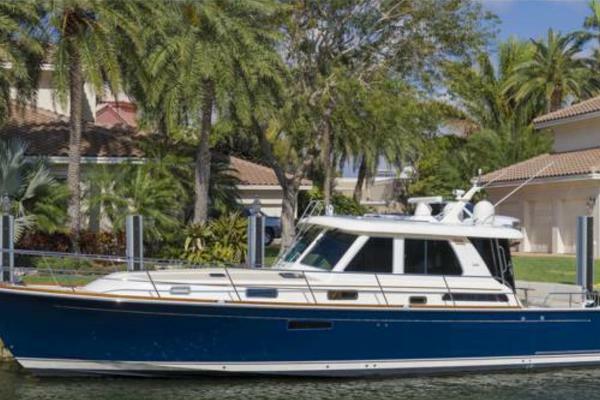 United Yacht Sales New Jersey would love to guide you through a personal showing of this 52' Krogen Express 52 2009. 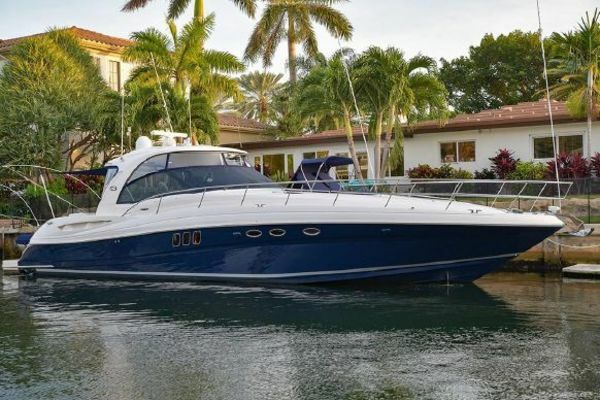 This yacht for sale is located in Moore Haven, Florida and priced at $1,349,999. For a showing please contact us by filling out the form on this page and we will get back to you shortly! Sirius Weather, integrated with Raymarine Chart Plotters. By subscription. Fusion Stereo System with separate controls for Flybridge, Pilot House and Salon (Bluetooth enabled). Iridium Satellite Phone and Dock. Subscription. Hull Design Designed by James Krogen, the Krogen Express 52 combines classic, timeless style with exceptional seakeeping and efficiency. Her plumb stem, raised bow, and broad beam forward allow her to slice through the waves with ease while providing a great deal of living space in her accommodations. Her low profile allows her to get under bridges as low as 16' and with a draft of just 4', she'll take you almost anywhere. Her semi-displacement hull delivers trawler efficiency at displacement speeds with true cruise capabilities in the mid-to-upper teens. And her generous keel provides stability and protection for her twin propellers.